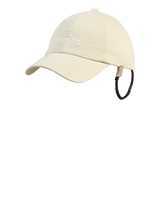 This classic peaked cap is a MUSTO favourite, ideal on deck, on the marina or in town. A self fabric peak will protect your eyes from the glare, while rear adjustment allows for a secure, comfortable fit. The addition of a retainer strap means you can strap your cap to your hood to keep it safe in high winds.